I can tell you it didn't work. But I tried real hard. Have you just ever felt so lousy that thinking hurt? I was getting ready to go on vacation and I was stressed. When did packing a couple of suitcases become so stressful? I couldn't decide what to take and it wasn't the clothes. It was taking the crap that I use to manage pain and I was terrified that I'd be curled up in bed in paradise. Forget the medication. I had to take a tens unit with extra pads for the electrodes. I took aromatherapy bottles. Did you know you had to advise the TSA that all these items you put in a Ziploc bag are medically necessary? Just as a shout out to the TSA, they were wonderful and took a look at me and offered to help me through the screening when it looked like I was going to fall over. When I got on the airplane I was prepared. I had taken pain medication and half a muscle relaxer. I was concerned because I can't sit longer than 20 minutes and even that is a stretch. I had my iPad and, mentally, I was ready. I really appreciated the bulkhead because I could stretch my legs straight out and put them on the wall in front of me. I plugged in my earphones and turned on the tens unit and, Hawaii, here I come! I was good for about 2 hours. That's when I had to start popping the medication. I stood up. I walked down the aisle. I meditated. I can honestly say that I was in a good frame of mind but my body was in another picture altogether. Let's say I made one tiny mistake. We live in a society that is a tad paranoid.....and rightfully so. There are some crazy people out there right now. We do have to become more aware and speak up if something doesn't look right, however, I didn't take into account what electrodes fastened to my body might look like with a small device that looks like a remote detonator. 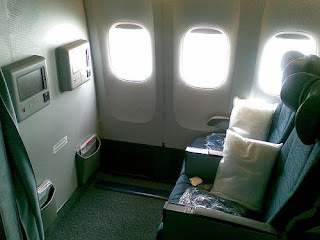 More than one head looked at the wires sticking out of my pockets and one motioned to the flight attendant. I was waiting for the lavatory and she came over to me and told me the story. We kind of got a kick out of it but, one the other hand, I thought it was admirable. This is a very good thing......watch and speak up.....no matter what. Anyway, by the time I landed I was ready to hit the beach. No matter what frame of mind I was in the pain was shooting down my legs. I tried to ignore it and think myself out of it but to no avail. I couldn't even sing Leaving on a Jet Plane to get myself out of it. But there is a good side to this. I didn't get arrested when we landed.